B-WEAR: We’re just getting started. 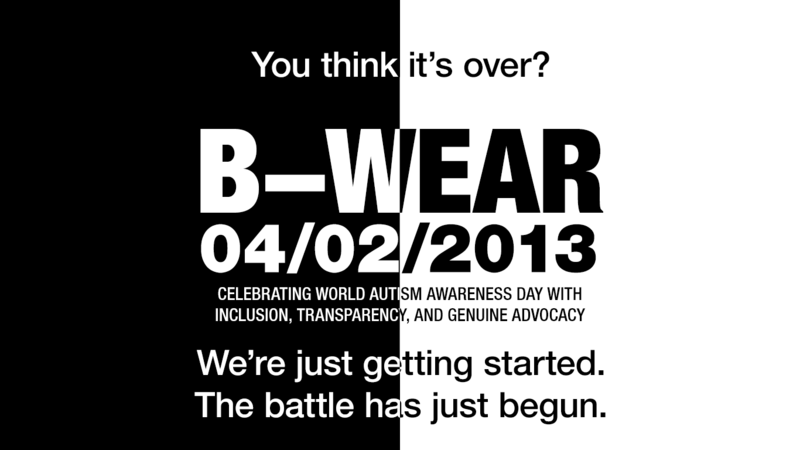 Even if World Autism Awareness Day will be over in hours, the battle for genuine advocacy is not yet over. As a matter of fact, as we speak, the struggle against the hypocrisy and the messages of intolerance of Autism Speaks is still in progress, and we’re just getting started. Even the day before, I was so disappointed at how some people would blatantly defend Autism Speaks’s nonsense. As a matter of fact, I had this discussion with a so-called parent advocate on Twitter, when I attempted to educate them of the false intentions of Autism Speaks regarding Light It Up Blue and suggested to them to consider events run by real advocates, specifically autistic self-advocates. And, lo and behold, I was accused of attacking them personally. The conversation went through, and it turns out appears to me that such parent advocate actually supports the bigots. And what is worse, they said I should even thank Autism Speaks for what they are doing to the autistic community. Thank them for what? For being bigots, for excluding autistic individuals from their “advocacy,” for promoting ways to eliminate autism and autistics from the face of the earth, for being frauds, for being hypocrites? I don’t think I will. I happen to be in a culture where word-mincing is preferred over an in-your-face approach. My approach of choice is the latter, which some of my affiliates in the local advocacy community feel it conflicts with the stand of the group. They wanted me to be diplomatic, and instead of using confrontational rhetoric in my posts, they wanted me instead to speak positive things about autism and individuals on the spectrum. As a parent and friend had told me, I should hold off from being “Gordon Ramsay”: blunt, unyielding, and naughty, and be like “Pope John Paul II” instead: charismatic, engaging, and nice. Now, as I have said, I am being nice when needed. As a matter of fact, I have written several articles showcasing talents and activities involving autistic individuals, and the main goal of this site is basically to showcase my adventures as Big Brother to my fellows on the spectrum. But not this time. Being a Big Brother to my fellow autistics, I feel that it is my duty to stand up for them, and stand up to discriminating, excluding, and dishonest agenda being propagated by groups who claim they speak for us, yet does the exact opposite. And yes, it’s Autism Speaks that I’m talking about. Maybe, when the battle ends in victory in our favor, I shall reconsider going back to the original tone of my posts. In the meantime, the battle continues. I am the Autistic BigBro — appreciates and loved by good, stands up to and feared by evil. World Autism Awareness Day is still up! And so is the battle against the bigotry and hypocrisy of Autism Speaks. In lieu of observing Light It Up Blue (which is a pro bono advertising campaign for Autism Speaks), show that you really care for genuine, inclusive, and honest advocacy by joining in counter-events organized by autistic self-advocates, like Autism Awareness Month, Light It Up BOO, Tone It Down Taupe, Shut It Up Grey, and B-WEAR.